Check out this fantastic offer on Nomination Jewellery from the 11th to the 26th October 2014. 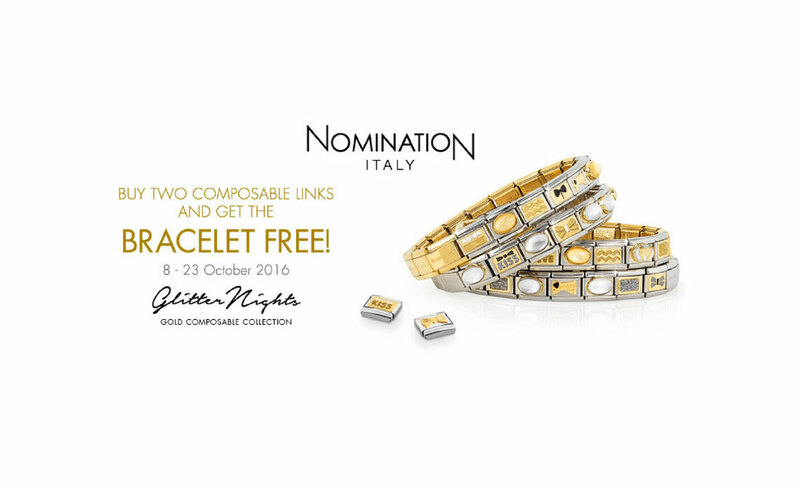 Buy two composable Nomination links and get the BRACELET FREE. To take advantage of this fantastic offer. Simply fill in the voucher at the bottom and bring it into our jewellery shop Gosforth, Newcastle. Nomination jewellery and bracelets simply tell your very own story. Each bracelet is personal to the person wearing it. Whether it is an unforgettable holiday, your first anniversary, a special birthday or moment in life. You can remember and celebrate these special moments by collecting and customising your bracelet. These beautiful pieces of jewellery, can reveal your past, present and future telling your very own story. Each time you wear them it is a reminder of life’s happiest moments. Made in Italy, Nomination bracelets are fashionable handmade pieces of jewellery for both men and women. These pieces are made using the highest quality of stainless steel, sterling silver and 18k gold. The stainless steel is rust-proof and new links and collections are always being developed. The charms are created for you to remember those important life events, telling a continuous story. Composable bracelets have revolutionized the jewellery world. The bracelets offer precious symbols, which are exclusively designed and soldered to every link. No matter what gender or age, these bracelets are the perfect present for both men and women of all ages. We have a fantastic selection of charms for your composable bracelet in store. From letters to zodiac signs, monuments, cities, cubic zirconia, gemstones, flags, pave, enamel, ornate settings, animals, good luck signs, messages, spirituality and much more. If you see a charm we don’t stock, please let us know and we will do our best to get the charm for you. You can find out more about Nomination Jewellery on our dedicated page. Why not view some of the collection in our Nomination gallery? Find out more about our jewellery services at David Hall Jewellers.